Be sure to check-out the Beach Music Cruise-In this weekend, which will combine both bands on the beach, and cars on the boardwalk. 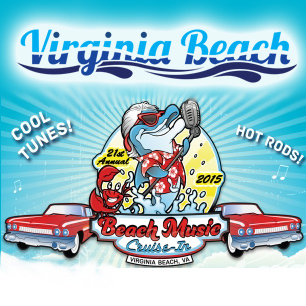 Relax in the sand as top Beach Music bands from up and down the East Coast play the best of the “oldies” on the beautiful Virginia Beach oceanfront! Be sure to also stroll the boardwalk and take a look at an array of classic cars, hot rods, antiques, and more! The car show will be held on Saturday from 10am-4pm. There will be food and adult beverages being served in tents on the sand, as well as a giant 20-foot inflatable jukebox! Admission is free, so come kick off your shoes and enjoy a weekend straight from the good old days!